Today is 31 October. According to my friend Wikipedia, it is the 304th day of the year (305th this year because it is a leap year) in the Gregorian calendar, and there are 61 days remaining until the end of the 2012. 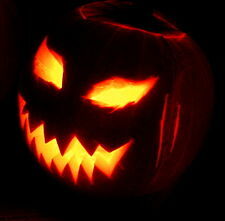 It is also Halloween in many places, with all that entails. Apparently, it is also National coat of Arms day in Ecuador (oh I just love Wikipedia for teaching me my new things for many days). And of course, it is the final day of Breast Cancer Awareness Month. There is lots of discussion about that around me. The day has many significances to us, in our different locations and cultures, but also in our own sense of where we are at a particular time. 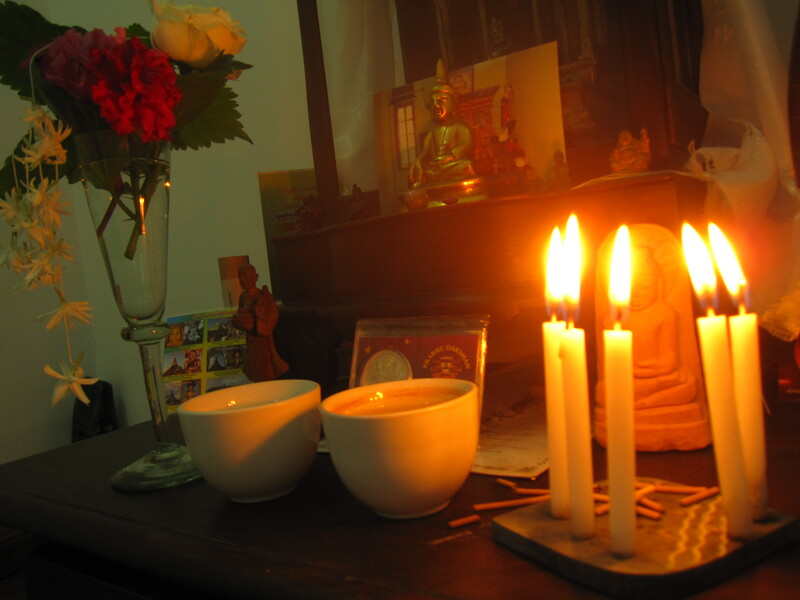 Over here in Myanmar, we have been marking Thadingyut, which brings the three months of “Buddhist Lent” to a close. 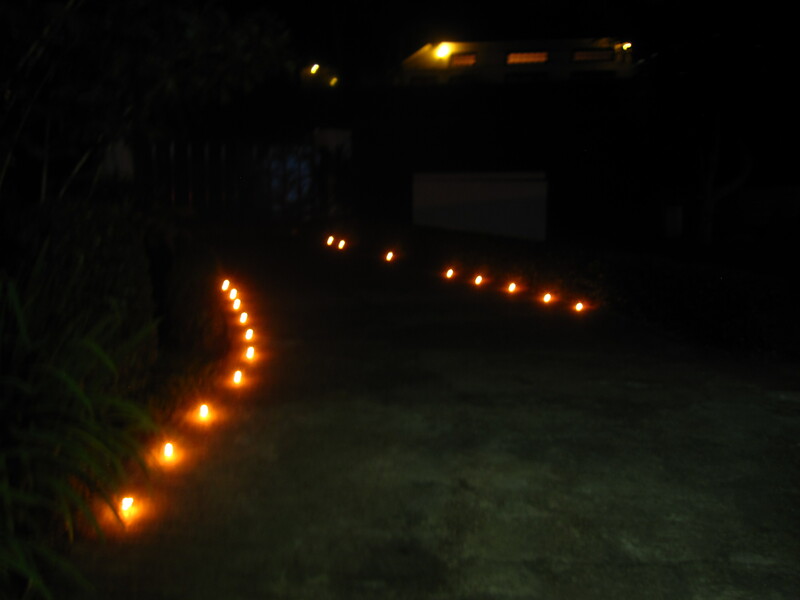 Yesterday evening I was welcomed home in the evening by rows of tiny candles around the gate, down the drive and around the house. 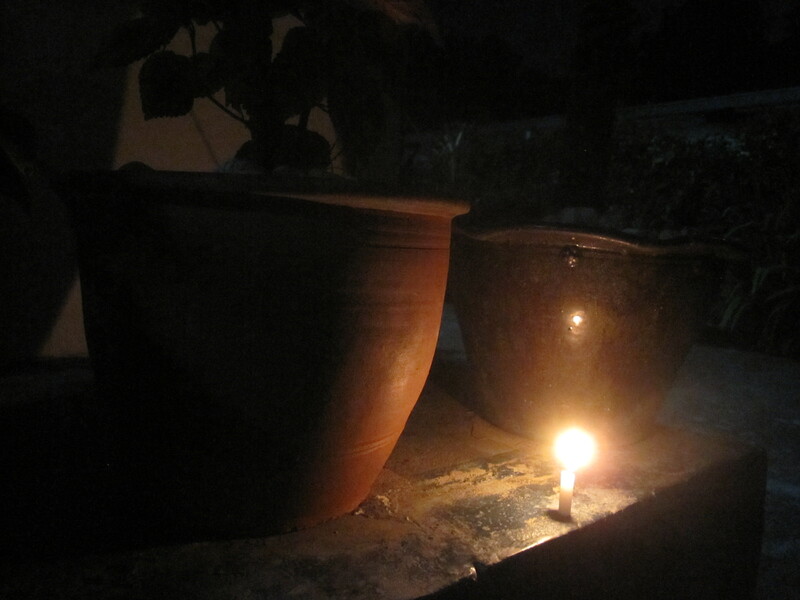 Houses nearby were bathed in light from candles and fairly lights. Fireworks louder than thunder crashed across the sky. The full moon sat heavily behind a mist of light cloud. There was a real air of festivity and spirituality around. The period of Buddhist Lent begins with the Waso full moon which usually falls in July and continues through the monsoon. This is a time when people are busy tilling their land and planting the paddyfields, and monks will not travel but stay at their monasteries. During this time, it is believed generally to be inauspicious to marry, to move house or to enter generally into a new venture. Hence the feeling of thanksgiving and celebration in the air over Thadingyut. This reminds me that I have a great deal to be thankful for. I am living and working in an amazing place at an amazing time, and able to experience such rich diversity. And even more thankful to be here after the last round of checks and scares. Today is another landmark day. Three years ago today, after yet another sleepless night with the weight of too many thoughts crowding my post diagnosis headspace, I took the plunge. 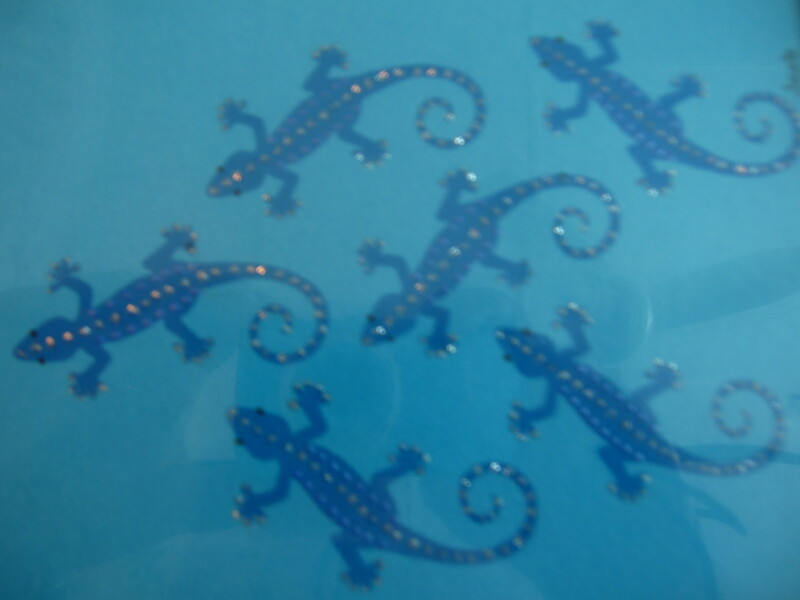 I had already been blogging as Feisty Blue Gecko for a couple of years, but needed a new online space for the new real space I had stepped into. 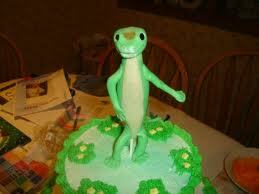 And this gecko-flavoured breast cancer blog was duly hatched. Last year, on my second blogaversary, I wrote a long post with some background detail, and characters which have evolved as the blog has taken on a life of its own. It is quite a blogossary. I could never have imagined how important the blog would become in my life, and how many incredible people I have connected with, the friendships I have formed and the lorryloads I have learned. And here I am, after three years. Still writing. Still ranting and venting. Still reflecting. Still making friendships and connections. Still processing and deliberating. And still getting a great deal off my chest! And guess what? 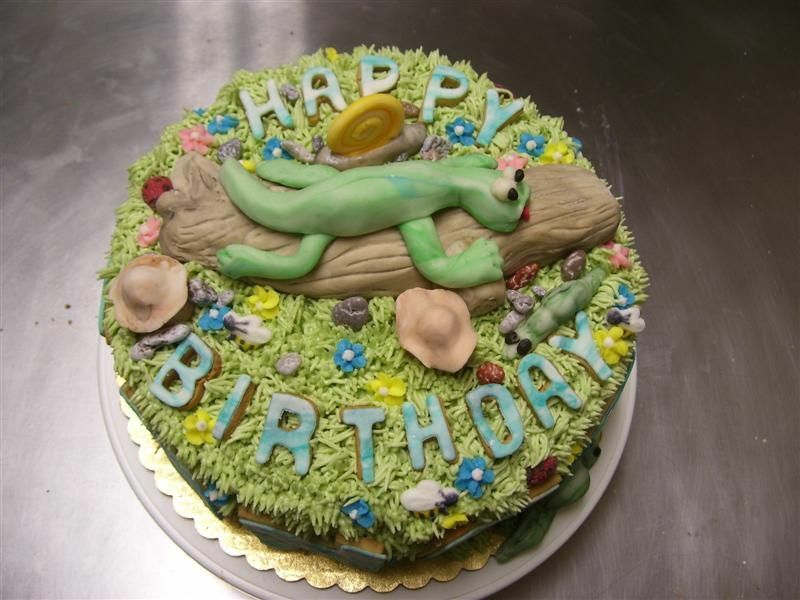 There are heaps and heaps of images of gecko cakes! 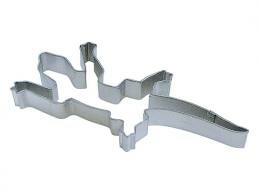 And not only gecko cakes, but even a gecko shaped cake cutter! Who would have imagined that? So, thank you dear gecko and dear blog. Here’s to many returns of the day, and many more years of irreverence and feistiness together! do not reach or choices are not there. Equally, there is a glaring lack of research around metastatic breast cancer (MBC). I am woefully uninformed about research into MBC, particularly over here, so am not going to even attempt to discuss that. But I want to focus on where I am, right here, right now and share some thoughts and observations, purely on awareness and its connection to pink. There is already more than enough for me to say about basic and real awareness. 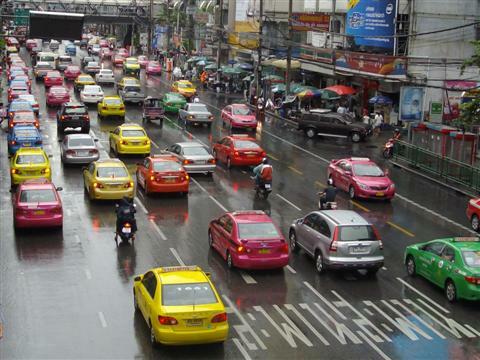 I flagged down a taxi outside the hospital in Bangkok on Day One of the checks, to head back to the hotel. The taxi was bright pink. 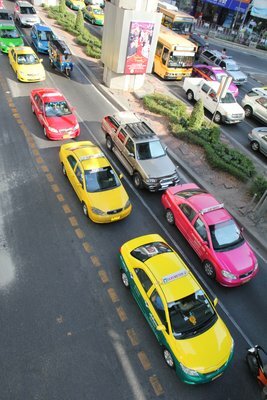 Now actually that is not unusual as many taxis in Thailand are pink. Some are green and yellow and a small number are blue, orange or other colours. But the majority, to my eye seem to be either pink or green and yellow. However, what struck me particularly about this taxi, was the upholstery which was a bright shocking pink! That is far less usual. 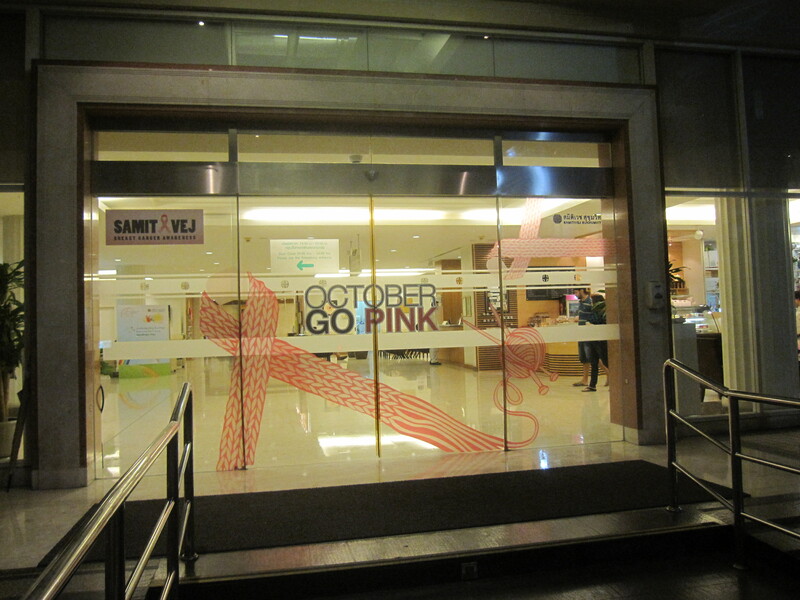 Having just drawn away from the hospital doors and their Pink October campaign, and being surrounded in the blogosphere by a range of views and discussions around pink and the pink ribbon, my mind was swirling in confusions and associations. Pink is a very auspicious colour in Thailand, and I would be very surprised if the first meaning associated with the colour is anywhere near breast cancer. People wearing pink t-shirts can be seen in swathes in Thailand, as a sign of support and respect. 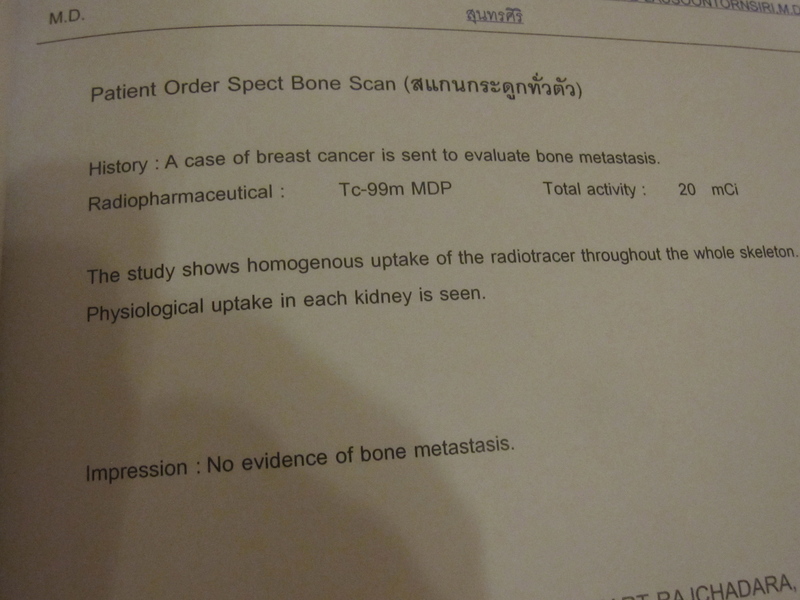 So in Thailand, pink already has differing significance and there is a wealth of pink in sight. In terms of Breast Cancer Awareness, there is a level of pink ribbon presence, but I have yet to see inappropriate or broad sweeping pink ribbon marketing. Then something interesting happened. In my bonus days in Bangkok, for the extra scans and work, I escaped for some numbing, only-looking shopping time to one of the big malls. 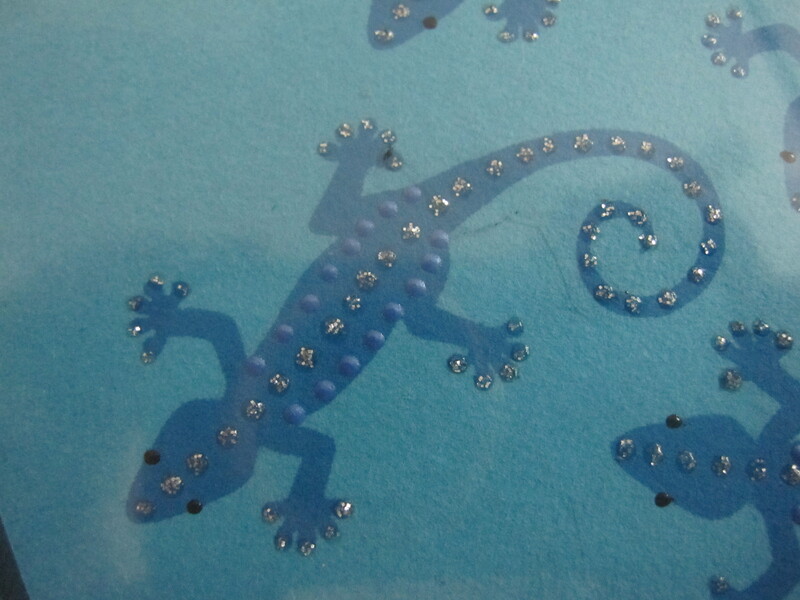 My eye was caught by a card display, with lovely geckos on the front. The cards were printed in brightly coloured, good quality paper. Each set came in a grouping of five colours. Of course, including blue. 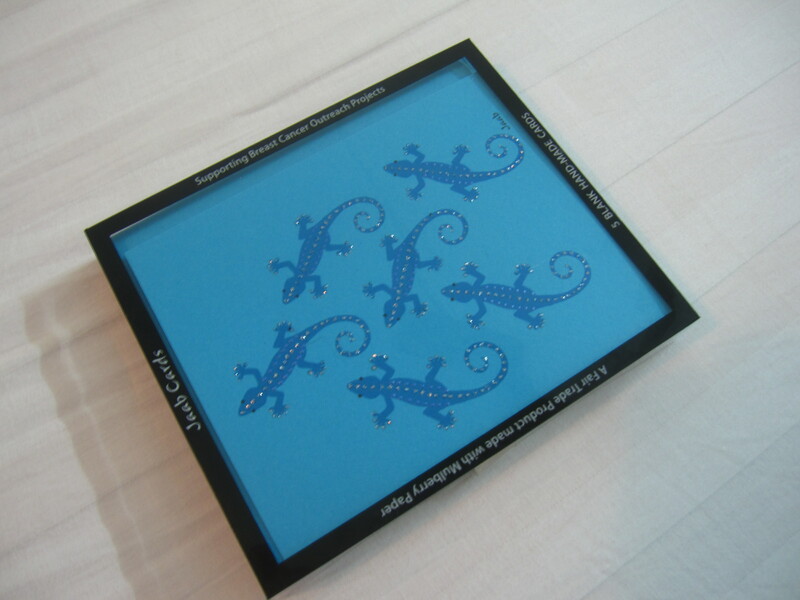 So one of the five cards in the set was the most beautiful image of a group of very feisty blue geckos. You have to remember that I live in an environment where there is little “pink ribbon” marketing, so to see this was incredibly warming. Not to mention, uncannily pertinent! This does not appear to me as commercialisation or exploitation of the pink ribbon. Jaab is a fair trade company and a proportion of the proceeds go towards a variety of Breast Cancer Projects. In particular, there is a focus on outreach work for women in marginalised or difficult circumstances. My views on pink ribbon marketing are no secret, and not exactly mainstream. 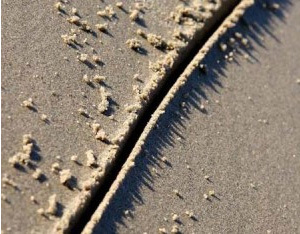 More like slipstream. I am keenly aware that the marketing seems to exist in extremes around the globe. Here, awareness seems to be much more tightly linked to the pink ribbon that it does in more commercialised contexts. After the checks in Bangkok, of course, I returned to Yangon. I have already written a fair bit about the void there is here in terms of awareness and marketing. It is not my intent to repeat what I have said earlier, but rather to add to this. I ran a short session earlier this month with a group here and showed the pink ribbon as part of the introductory discussion. Not ONE single person knew its association / designation of breast cancer. Not one. I knew awareness was in a different place, but this really shook me, and shows just how incredibly inconsistently the pink ribbon is known and used around the world. We went on to discuss some basic awareness including signs to have checked, and again talked explored beliefs about causes and risk. Many believe that wearing old and tight underwear is a cause, and that it is a disease which mainly affects unmarried women. 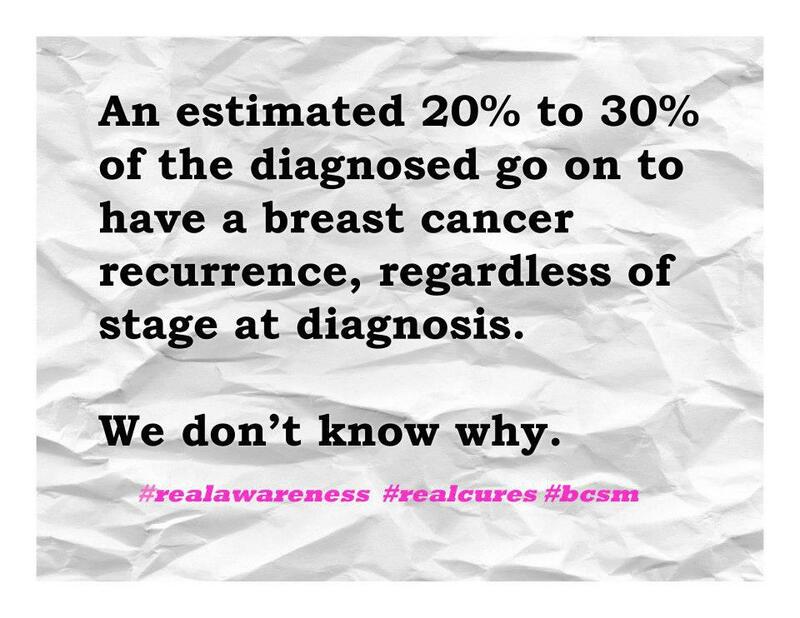 For me real awareness is just that. REAL awareness. And it is so important here, for example, where much is very different, yet the disease impacts cruelly and indiscriminately. My plea is simple. All I ask is that we remember that awareness varies enormously, as does the use of the pink ribbon and merchandising. There are so many different shades of pink. And perhaps we can learn about different ways of balancing marketing with awareness raising from unexpected sources.